Make your year the way you want it. Mark every moment with personalised calendars. Make your calendar unique with backgrounds, clip arts and more. Go for A3, A4 or square, with various layouts. Order online, anytime, anywhere from your computer, tablet or mobile. Buy more than one to save. See bulk pricing. Every choice is yours. With each calendar you make, you'll be in complete creative control. Choose a design, then fill it with as many photos as you like. Add frames, backgrounds and clip art to make your calendar unique. Whatever you add you can take away. Make it yours. Begin your calendar from any month and add personal and national events. Every calendar includes a hole or hook, for easy hanging. Our creator tool makes it easy to add national events, birthdays, and more. No need to wait until January. Make the calendar that suits you. In the cart you can switch to premium paper and you’ll be able to choose from a matt or gloss finish. Our standard calendars have an extra matt option too. High quality paper finished with a smooth, semi-matt coating. Professional quality paper with high colour intensity and sharpness, a smooth surface and a glossy finish. Uncoated thick bright white paper for better durability. Our very best paper offering with a truly exceptional finish. 260g/m2. Professional gloss photo paper with high colour intensity and sharpness, a smooth surface and a glossy finish. Professional matt photo paper with a fine grain pebble texture and a deep, non-reflective matt finish. Once you order, we aim to deliver your photo calendar within 5-7 working days. The shipping costs are £ 3.99 for your first calendar, plus £1.49 per additional calendar. To create photo calendar gifts for friends and family simply search through your PC or smartphone photo folders and select your favourite images ready to make your own calendar online. At bonusprint, we pride ourselves on the high-quality of our photo calendars while making the creative process quick and easy. Your design is printed and produced by skilled specialists using our state-of-the-art printing equipment. At bonusprint, we love to brighten up people's worlds by bringing special memories together in beautiful picture calendars. Our calendars come in three sizes: 20 x 20cm, 20 x 30cm, 30 x 40cm. All of our photo calendars are available in a traditional or single line grid format. In some designs, we list dates as a traditional grid, in others the dates are laid out across a single line. Depending on which paper type you choose – we have both premium photo paper and standard paper – you can create your calendars with a matte, gloss or extra matte finish. A 2019 photo calendar is a convenient tool, helping you to keep busy schedules organised. Photo wall calendars are also perfect reminders of precious time spent with friends and family. Our calendar maker is packed full of creative options with different layouts, formats, and backgrounds. When creating your year calendars for 2019, you’ll be able to fully customise your 2019 photo calendar using our range of backgrounds, frames, masks and clip art. You'll see why it's easy to make the best photo calendar ever. Visit our intuitive and informative site from your computer, tablet or smartphone to design your own creations and place your online order. Surprise grandparents or special family members by making a custom calendar especially for them. Select photos they'll love to see and personalise it by adding important family dates for the coming year. You can also start your personalised photo calendar or wall calendar from any month of the year to create a special calendar as a birthday or anniversary gift. To create a personalised calendar with your own photos, choose a three panel, photo grid or collage design and fill it with as many pictures as you like. Choose a matt or gloss finish, or for something extra special upgrade to our premium photo paper. When viewing our pre-designs, keep in mind that the photos you see are all completely editable and removable: we’ve included them as examples but we want you to make your calendars truly yours, by using the moments that really mean something to you. Once you’ve selected a design, you’ll be able to choose whether your calendars are printed on premium photo paper or standard paper. For truly memorable calendars that will shine all year, we recommend premium photo paper. When using our creator tool you’ll notice that, in your design, each month of your calendar has an editable background colour and, depending on the pre-design you choose, a pattern. We’ve chosen some colours for each pre-design to get you started, but you can easily change these by selecting a month, then selecting the ‘backgrounds’ tab. The same goes for frames, clip art and layouts: you can add and change these for every month on your calendar. You can make any changes you want to the cover of your calendars, too. Once you’re done editing, select ‘Add to basket’. You’ll be taken to the checkout, where you can choose the finish for your calendars. 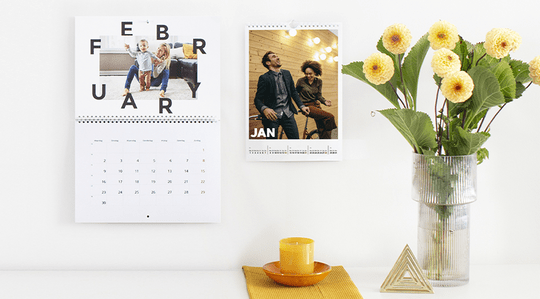 Depending on whether you chose premium photo paper or standard paper for your calendars, you’ll have the option for matte, gloss, and extra matte. Once you hit “save and continue” you’ll be ready to enter your delivery details and order. Your calendar should be with you in no time! Create a 2019 calendar in an A4, A3 or a square design or why not choose different shapes and sizes for different rooms of the home? With a large wall calendar in the kitchen or your office, you can keep track of family activities especially if your custom calendar is already printed with birthdays, anniversaries and holidays. When you order a photo wall calendars from bonusprint, the choice is yours every step of the way. Each of our photo calendars comes with a sturdy ring binding ready to stand on your desk or hang on a wall. As the year goes on, flipping over the months of your 2019 calendar reveals a new memory. Our online calendar maker guides you every step of the way. Decide whether you want one large photograph for each month or a collage made with several of your favourite pictures. Then, use the calendar creator to choose a size and shape along with the type of paper and finish. Now, the fun really starts. Play around arranging your photographs, add backgrounds, borders and clip art and when you're completely happy we'll show you how to order your calendar with photos. Follow the steps of our calendar maker, to create a custom wall calendar that starts from different months of the year. This turns it not only into a seasonal gift but a beautiful birthday or anniversary present as well. Make keeping track of busy lives easy by displaying large wall calendars prominently in your kitchen or office. And, keeping everything on track is even easier when you order a calendar with photos that's also printed with your own choice of important dates and anniversaries. Smaller photo wall calendars are great for offices or fixing to the fridge door with a magnet while large wall calendars come with hook or holes for easy hanging. Everyone's schedule is different so choose the best photo calendar for your needs by customising it to suit. When you order a calendar with photos, design it to display each month as a grid or pick numbered lines that leave plenty of room for writing in appointments and events. A calendar with week numbers is ideal for the whole family's schedule. Pin it up on your wall, prop it on your desk or attach it to your fridge with a magnet and you’ll never miss an appointment or forget a birthday again. Simply jot down those vital dates at the start of the year and there you have it – a personalised calendar that never crashes or runs out of power. The best photo calendars are ones customised to exactly meet your needs. With our photo calendar creator you can do so much to achieve the best results. When you make your own calendar, choose a range of background effects that include woodland and nature scenes as well as colourful abstract designs and attractive patterns. You can also finish your design with watercolour or paintbrush effects. We make it possible to make your own photo calendars, creating personalised calendars which combine usefulness with the ability to make you smile each and every time you check the date. You can make your own year calendars to give as special gifts to friends and family or simply to brighten up your own home or workplace, but no matter why you create your personalised calendars, you’ll be crafting something which is totally unique whilst being produced to the highest professional standards. Whether Christmas is around the corner or someone special has a birthday or anniversary coming up, surprise them by placing an online order for a bonusprint personalised calendar. Follow our simple steps to design and make your own calendar then, when you're happy head to the checkout and place your order. We know you're going to love your photo calendar. If you want to share your creation with friends and family, we’re offering discounts on every photo calendar when you order more than one. If you order five calendars you’ll get a 25% discount on your photo calendar order; with 20% off for four calendars, 15% for three, and 10% for two. Once I had got used to the tech making a calendar was very easy and the final product was amazing. The pictures are true to colour, the finish is very high quality and extremely good value for money. Altogether a fun and personal gift. The calendar was a breeze to make and easy to follow bonusprint instructions. The only thing made me think about is the delivery costs. More you order, higher the delivery cost is. Be nice to have a one of cost. Nice to do business with them.